SEEKING BACK UP OFFER. 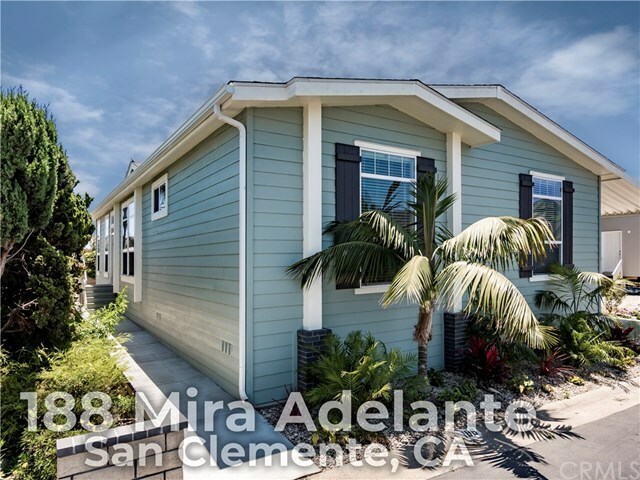 Brand new single story beach house completely upgraded on land that you own in San Clemente's premier ocean & golf close age qualified community of Shorecliffs Terrace. Great room plan w/ soaring vaulted ceilings, high quality designer selected finishes: laminate wood floors, solid wood cabinetry, crown molding, big baseboards. Island kitchen with breakfast bar & dining room is a cook's delight w/ quartz counters, farmhouse sink, stainless steel appliances including gas range, microwave, dishwasher, & fridge. Laundry rm w/ cabinets & full size side by side hookups for gas dryer. Enormous bedrooms with vaulted ceilings, ceiling fan prewire, crown molding. Master suite is incredible with dual vanities & the biggest walk in closet one could dream of with a solatube for natural light. High quality energy efficient construction with dual pane vinyl frame windows, central heat. Storage shed/workshop. Exceptional location near the clubhouse. Resident owned community offers an amazing active lifestyle with cool neighbors, RV Parking, heated pool, clubhouse with banquet facilities, woodshop, exercise room, billiard room.